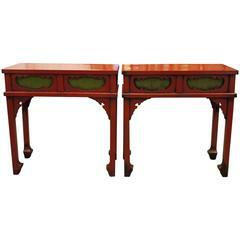 A pair of Chinese red lacquer console tables, available as the pair, or individually. Finished in deep red lacquer, the aprons have intricate carved design, and the tops have upturned ends. 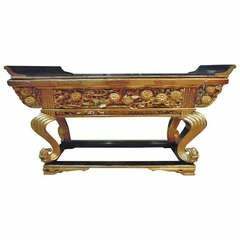 Small and attractive Chinese 19th century console table of simple form, with stretcher. Elmwood. 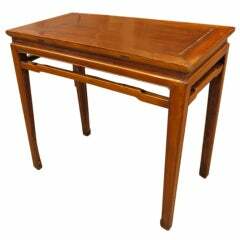 19th century Chinese console table with four drawers in apron, and simple hardware. An interesting and useful pair of vintage Japanese red lacquer side tables. The aprons have inset green ribbed details and the legs are gracefully shaped. Vintage painted Chinese red altar table.